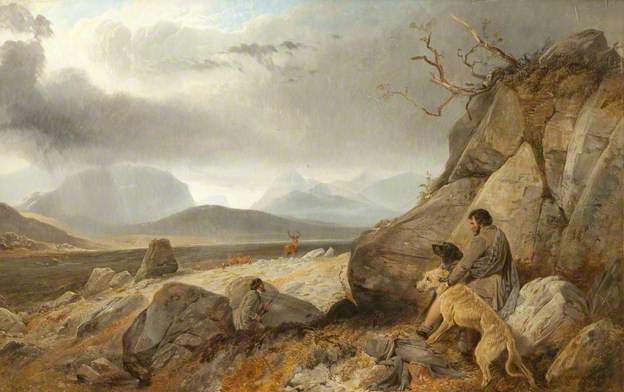 Painted during one of Ansdell’s many trips to Scotland. In 1868 he built Moy Lodge beside Loch Laggan, Inverness-shire. NB This doesn’t automatically put this painting post 1868 as he visited Scotland many times before he built his lodge. Ansdell was gifted two deerhounds who became his regular models – they were called Oscar and Spey and appeared in major works as early as the 1840s and 50s but there is no way to be sure if these are one and the same. This painting, a scene of deer stalking, has really benefited from being cleaned. The cleaning has brought out the lovely subtle colours of varying beiges, browns and soft blues that Ansdell so sympathetically used to depict the landscape of the Scottish Highlands. The viewer is almost transported to this scene of relative calm before an approaching storm creates havoc. The threatening storm clouds are echoed emotionally in the very real threat to the stag in the centre distance which, until a few seconds ago, was peacefully grazing with his hinds. All eyes are drawn to the stag, the focus of the landowner with his rifle, and ultimately, the deerhounds who are being strongly restrained by the ghillie (gamekeeper) – they are raring to go and can smell blood. It will be their job to fell the stag and the ghillie’s job to bring the carcass down to the shooting lodge, probably with the help of a sturdy Highland pony. The beauty of this painting is in the colours used and the lovely depiction of the distant mountain range with a river glinting in the sunlit valley. It is cold despite the ghillie’s bare leg.